Split the egg whites from the yolks, in a bowl whip up yolks with sugar, add mascarpone and mix well. whip up egg whites adding a pinch of salt , amalgamate them to the other compound prepared before, trying not to “dismantle” the egg whites. Meanwhile, prepare an Italian coffee machine (a 6 cups one), when the coffee is ready chill it in a plate. Cover the bottom of the case with savoiardi, to have an idea of how many biscuits you need for tiramisu, then dip savoiardi into the coffee, attempting not to dip them too much, 2 seconds from each side are enough and after that place them into the recipient. Using a palette knife dispose the cream over the biscuits, after which you can continue with an other layer of savoiardi and cover with the remained cream. But I prefer only one layer, so the dessert is lighter. In the end sprinkle cocoa on the tiramisu, if you want you can add small drops of cocoa or other decorations as you prefer. Keep it on the fridge and serve cold. This entry was posted	on Saturday, April 5th, 2008 at 11:22 am	and is filed under Cooking Time, English Version. You can follow any responses to this entry through the RSS 2.0 feed. You can leave a response, or trackback from your own site. Thank you so much for this recipe! No one is happier than my wife, she LOVES tiramisu, I’m going to score big points with this one! 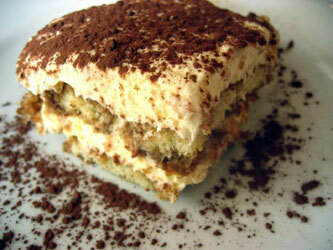 Man I was just reading the recipe and now I’m all on Tiramisu’!! Need to get the wife making some! !